Background: Middle-aged and older patients are prominent users of telephone triage services for timely access to health information and appropriate referrals. Non-compliance with advice to seek appropriate care could potentially lead to poorer health outcomes among those patients. It is imperative to assess the extent to which middle-aged and older patients follow triage advice and how this varies according to their socio-demographic, lifestyle and health characteristics as well as features of the call. Methods: Records of calls to the Australian healthdirect helpline (July 2008-December 2011) were linked to baseline questionnaire data from the 45 and Up Study (participants age ≥ 45 years), records of emergency department (ED) presentations, hospital admissions, and medical consultation claims. Outcomes of the call included compliance with the advice "Attend ED immediately"; "See a doctor (immediately, within 4 hours, or within 24 hours)"; "Self-care"; and self-referral to ED or hospital within 24 h when given a self-care or low-urgency care advice. Multivariable logistic regression was used to investigate associations between call outcomes and patient and call characteristics. Results: This study included 8406 adults (age ≥ 45 years) who were subjects of 11,088 calls to the healthdirect helpline. Rates of compliance with the advices "Attend ED immediately", "See a doctor" and "Self-care" were 68.6%, 64.6% and 77.5% respectively, while self-referral to ED within 24 h followed 7.0% of calls. Compliance with the advice "Attend ED immediately" was higher among patients who had three or more positive lifestyle behaviours, called after-hours, or stated that their original intention was to attend ED, while it was lower among those who lived in rural and remote areas or reported high or very high levels of psychological distress. Compliance with the advice "See a doctor" was higher in patients who were aged ≥65 years, worked full-time, or lived in socio-economically advantaged areas, when another person made the call on the patient's behalf, and when the original intention was to seek care from an ED or a doctor. It was lower among patients in rural and remote areas and those taking five medications or more. Patients aged ≥65 years were less likely to comply with the advice "Self-care". The rates of self-referral to ED within 24 h were greater in patients from disadvantaged areas, among calls made after-hours or by another person, and when the original intention was to attend ED. Patients who were given a self-care or low-urgency care advice, whose calls concerned bleeding, cardiac, gastrointestinal, head and facial injury symptoms, were more likely to self-refer to ED. 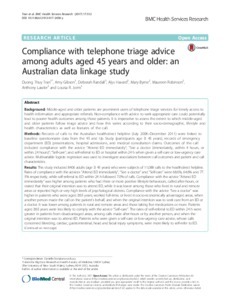 Conclusions: Compliance with telephone triage advice among middle-age and older patients varied substantially according to both patient- and call-related factors. Knowledge about the patients who are less likely to comply with telephone triage advice, and about characteristics of calls that may influence compliance, will assist in refining patient triage protocols and referral pathways, training staff and tailoring service design and delivery to achieve optimal patient compliance.